After two days of proposing the concept in Indispire the thoughts knocked into my mind...what will happen if its get selected, some bloggers will share their thoughts, a discussion will continue through different blog posts, then ? will any change take place? anything will change? Change...Hmm...the inevitable one but it needs time to take place, sometime it takes too much time specially in those fields where change is needed faster. Sometime with some of the parents i shared some ideas so that their children can focus on their desired streams,the ideas i shared were nothing but the ideas and concepts i read in different books and learnt from TRULY educated human beings but the result was upsetting, though most of the parents listened with deep concentration but continued with their previous thoughts. The parents are pressurizing their children for better marks...this is so common to listen, lots of discussions and researches have already taken place but has anything changed ? then why some people are still continuing to make discussions and researches in this fields,there can be two reasons...firstly,with a little hope that change will take place one day and secondly, to make themselves calm after bringing out the irritation that are burning their hearts, once in an International Journal one of my articles on educational psychology has been published and i wrote it for the second reason mostly. and both of their total percentage is same then we consider their level of merit is same....this is what i read. Neither the teachers nor the parents focus on the merit of the student according to subjects and both of these student will be pressurized to take admission in science stream. without going to too much deeper discussion, let me share something common...i personally know two boys, both of them are working in a govt. office, the first one ranked third in the entire state in class X board exam(later did nothing remarkable) and the second boy never ever ranked in any exam whether in class tests or board exam, always secured average 60% marks but both of them are presently the govt. officers in the same post, so logically a single result does not matter much. Seeing some of the human beings ,who are working as primary school and high school teachers, i really feel to laugh at some people, hold on, i am not disrespecting the primary or high school teachers, rather i have deep respect specially for the teachers of primary school because they are working in the grass root lever, teachers are the base makers, then why i feel to laugh at SOME PEOPLE? actually with the pace they started their student life, holding first position in every class, securing the top marks in school or in the district in board exams, the speed, the dedication and the MERIT they showed that time i thought they will end up being a world famous scientist or philosopher or engineer...whatever it is but she/he will surely be a world famous personality and for such an expectation some people are responsible who used to praise those students so intensely and in profound way,the praises and the appreciations of that time, the discussions about that first boy or girl every where...all these forced me to think so but i am upset...they are not world famous now, somehow managed a job in school as a teacher, presently they are working with the other human beings(their colleagues) who have never secured first or second rank ,those colleagues have never been able to enlist themselves among top ten/twenty students in any class, presently those rank holders draw the same salary with those who never hold any rank in class, presently they have same designation the non-rank holders have. Its very common to listen about students killing themselves and for the students who are spending their lives in extreme pressure and intolerable mental tortures of their parents i would like to share my upper mentioned thoughts to show them...getting 50-60% of marks you can spend your life very happily and with financial security. Anything wrong happening with a student for the mental pressure and torture..not only the the parents are responsible rather the entire society is responsible and this is the society we have made...ridiculous it is...is not it? In every colony...whether it is in a metro city or town,semi-town or village...a rank holder student always get special treatment and others are ignored such a way that they even do not exist, does not matter those other students have skill/quality in music/cricket/football/painting/ or something else except study. By the way, to cover up a long distance journey you must have to start with low speed otherwise just go back to the people (when you were a student) and ask them what were their expectations from the first boy/girl of your class. ....Firstly,A boy/girl is tagged as "Good boy" or "Good Girl" , no one focuses(Or want to know,never me discussions) on the character ,good ethics or moral values, a 90%-95% marks holder is always treated as a "good boy/girl" where they should be tagged as "Good student"...this is much logical i think. Secondly, the entire nation is suffering from unemployment, Govt. does not have proper infrastructure or planning to wash away the employment problem and with this, bribe has added extra height so in this scenario every parent are worried about the future of their children, so logically its not the parents who are solely responsible for pressuring their children. 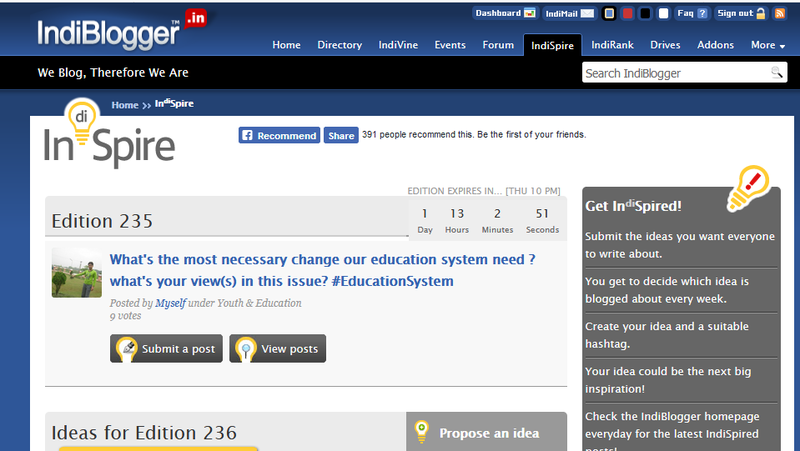 My next post will be Blog to PM covering this indispire prompt with a little bit of hope that may be one day the govt will give it a thought.